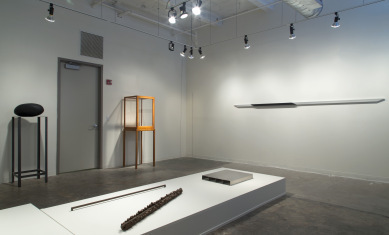 The exhibition “Selections from the Michael Lowe Collection” at the Art Academy of Cincinnati focused on the local collector and private dealer’s collection of Minimal, post-Minimal, and Conceptual art, with works dating from 1965 to 1987. The exhibition transported me back to my years in New York. After I finished my graduate work in art history at the University of Cincinnati and a brief stint at the Contemporary Arts Center, I moved to the city in 1977 to work at the Sperone-Westwater-Fischer Gallery, a union of the Italian Gian-Enzo Sperone who had galleries in Turin and Rome; the Dusseldorf gallerist Konrad Fischer; and Angela Westwater, a Buckeye, former publisher of Artforum, and Carl Andre’s lover at the time (he did the laundry). During my 30 years in New York, I met many of the artists in Lowe’s collection, including Ulrich Rückriem Richard Artschwager, Jene Highstein, Fred Sandback, James Lee Byars, Donald Judd, and Sol Lewitt. Seeing their work here was like seeing old friends in a familiar setting – a white-box gallery. Conceptual and post-Minimalist art make up the bulk of the collection. Only Donald Judd (1928-1994) and Sol LeWitt (1928-2007) can unequivocally be called Minimalists, and they’re represented by two unremarkable sculptures, a minimal representation of Minimalism. There’s a coffee-table-sized model of an open-grid Structure, 1968, by LeWitt. Judd’s piece is an untitled 1967 metal rectilinear piece, composed of four equal parts and presented on a low platform. Minimalism emerged in the early 1960s as artists moved away from Abstract Expressionism toward geometric abstraction, serialism, an interest in industrial materials and fabrication, and a cool v. hot sensibility. In 1964 Judd’s sculpture and fellow Minimalist Dan Flavin’s (1933-1996) fluorescent tube sculptures were both exhibited at the influential Green Gallery owned by Richard Bellamy. There were two landmark museum exhibitions in 1966 — “Primary Structures: Younger American and British Sculptors,” curated by Kynaston McShine at the Jewish Museum in New York and “Systemic Painting,” curated by Lawrence Alloway at the Guggenheim Museum that announced and defined this style. Post-Minimalism developed nearly concurrently although the term was not coined by critic and art historian Robert Pincus-Witten until 1971. Post-Minimalism as it is generally understood – geometric forms perhaps softened a bit, serialism and repetition, use of simple and commonplace materials, and a sense of the handmade — can be said to have begun with Lucy Lippard’s 1966 “Eccentric Abstraction” exhibition at the Fischbach Gallery in New York, featuring work by Eva Hesse (1936-1970), Louise Bourgeois (1911-2010), Gary Kuehn (b. 1939 – ), and Bruce Nauman (b. 1941 – ) (the last two are part of the Lowe collection). Julianne Cordray in “Post-Minimalism” (www.theartstory.org/movement-post-minimalism.htm) likens post-Minimalism to post-Impressionism as it encompasses a range of styles or expressions that “are related, yet which often have very different, even opposing interests.” She goes on to group body art, process art, site-specific art and, by extension, land art, and performance as well as certain aspects of conceptual art under the term. Kuehn is represented here with his 1969 Clamp Piece. A length of metal, likely aluminum, is being forced into a curve by being clamped to another already curved metal (steel?) piece. 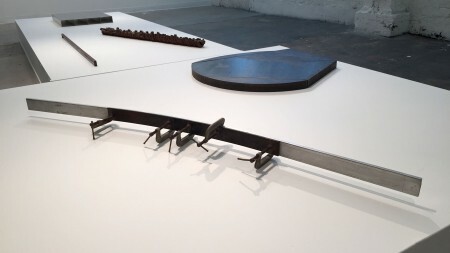 The materials are industrial but effecting the curve is definitely low tech and involves the artist’s hand. There was also a desire by artists in the ’60s and ’70s to escape the gallery if not the gallery system. Artists such as Robert Smithson (1938-1973), Nancy Holt (1938-2014), Dennis Oppenheim (1938-2011), Walter de Maria (1935-2013), James Turrell (b. 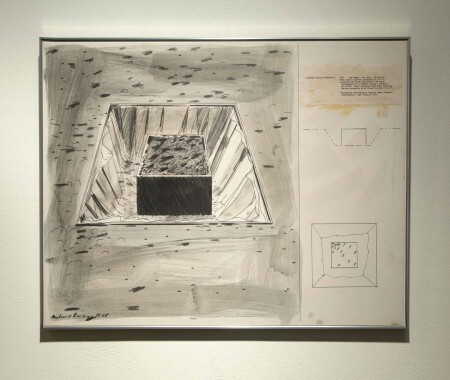 1943 – ) , and Michael Heizer (1944 – ) created massive earthworks, but still recognized the economics of art production by creating accessible, i.e., purchase-able, drawings or small models. Heizer is represented here with Sanguine Surface Seduction, 1968, a pen and ink with gray wash drawing of a project that I don’t believe was realized. Under Cordray’s expansive definition, performance art is post-Minimalist. It exemplifies what might have been the most successful attempt to escape the economics of the gallery system. How could a temporal piece be collected? There is no model in the traditional performing arts. Someone might own the original score to Puccini’s La Bohème but not a performance. 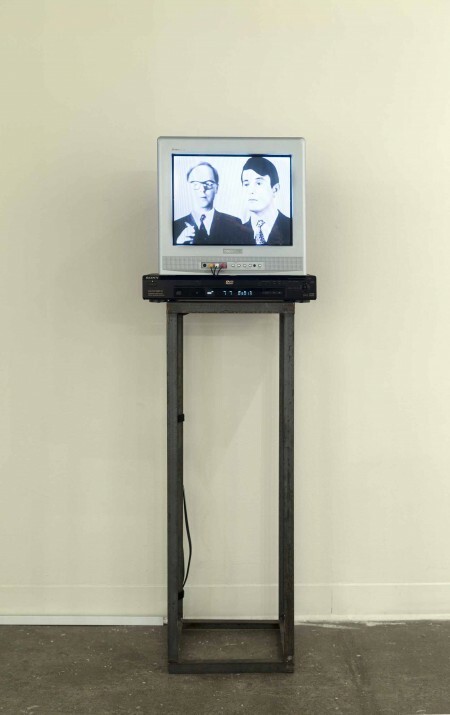 In the visual art world, a film of a performance can be acquired as they now are by public institutions and private collectors such as Lowe.1 He has collected at least three performances by the British duo Gilbert (1943 – ) and George (1942 – ): In The Bush (1972), A Portrait of the Artists as Young Men (1970), and Gordons Makes Us Drunk (1972), which run on a continuous loop on a video monitor in the first gallery. Always dressed in identical suits that any City banker in London might wear, their pieces are modest and unassuming presentations. Lowe also owns something more conventional by the pair: Reclining Drunk, a slumped Gordon’s gin bottle. Presumably it was its contents, which contributed to the 1972 performance. Arman is well known for his accumulations of mundane objects, but this work is one of his “Colères.” The French word means anger, rage, ire, displeasure, and wrath, an appropriate name for Arman’s works where an everyday object is sliced, burned, or smashed. In this piece, a woman’s pump is cut in half and placed toe to heel, as a pair of shoes would be in a shoebox. 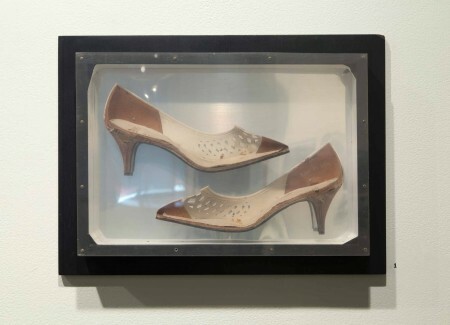 Arman frequently presented his work in plexiglass cases, and the box here is both a nod to that and how shoes are often stored. 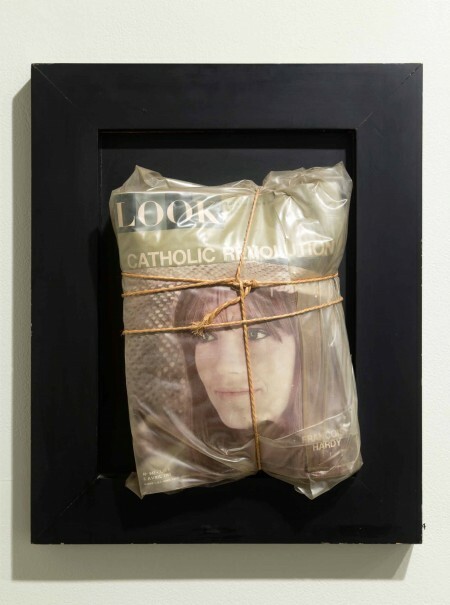 Installed on the far left of the wall with Arman’s shoes is the 1965 Wrapped Look Magazine by Christo (1935 – ). (Christo did not co-sign his work with his wife, Jeanne-Claude, until 1994.) Christo, who was born in Bulgaria, moved to Paris in 1958 and was one of a group of younger artists who were part of Arman’s circle there. I have always enjoyed the humor of Richard Artschwager (1923-2003), especially his riffs on furniture. Here he’s represented by a number of his familiar blps (not “blips”); they are as unassuming as he was and just as smart. These elongated ovals executed in a variety of materials were scattered throughout the galleries, making it a bit of a treasure hunt to find them. The title tells all: Locations. It’s dated 1969. This arrangement harkens back to his 100 Locations, a series of blps installed throughout the Whitney Museum of American Art for the 1968 “Contemporary American Sculpture” exhibition. Jennifer DeVere Brody in her 2008 Punctuation: Art, Politics, and Play, published by Duke University Press, suggests the blps drew attention to the Brutalist architecture of the Marcel Breuer-designed museum building and to the art exhibited, publicly questioning the institutional context of art. I always liked Fred Sandback’s (1943-2003) spare installations of yarn crisscrossing a space, defining it in an austere and elegant manner. The one from 1974 here is modest, just a couple of strands of charcoal or blue yarn stretching at a slight angle from the floor to the wall in a corner; it calls attention to the space in a reserved way. From a distance, there’s an optical illusion that makes the sculpture more material. I regret seeing the exhibition just a day before it closed, as it deserved more than a couple of hours. I hope that the Art Academy students took advantage of being able to slip into the gallery between classes to experience the aesthetic zeitgeist of the ’60s and ’70s. 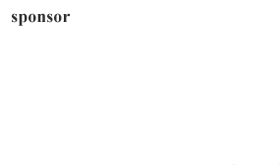 1 I don’t know the answer to this, but could videos of a performance be “editioned” like a print?